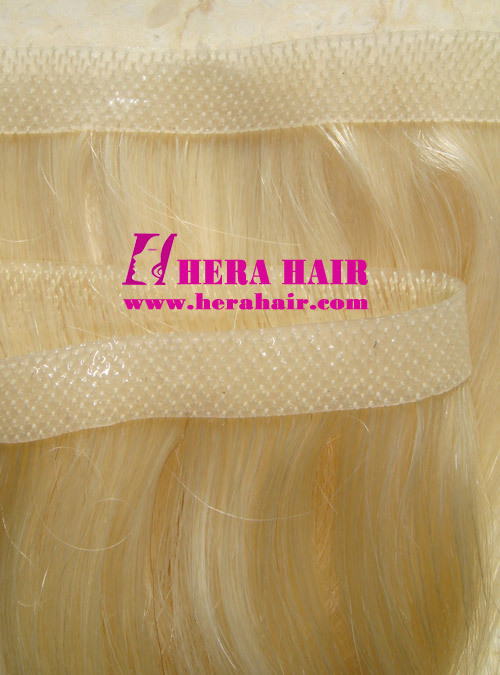 This tape in hair extensions is Hera's blonde European handtied skin weft tape in hair extensions, which is one invisiable and easily applied hair extensions. Tape in hair extensions is very good choice to add your hair density, add your hair length and add highlight etc. because tape in hair extensions will not damage your own hair and are very easiy to apply and remove, you even can add and remove tape in hair extensions at home by your family. Hera can supply three kind of tape in hair extensions, which is glue tape hair extensions, double needle tape hair extensions and handtied skin weft tape hair extensions. Double needle tape hair extensions are updated products base on glue tape hair extensions. Normally speaking, Hera's handtied skin weft hair extensions wholesale is 10packs for same hair length and hair color. Handtied skin weft tape hair extensions are hand tied the hair base on transparent PU so the production will take longer time, which is about 15 - 20 days according to hair order details. Except European virgin hair handtied skin weft tape hair extensions, we also can supply Malaysian virgin hair, Brazilian virgin hair, Indian virgin hair, Chinese virgin hair etc. hair materials and we can do different hair ratio according to your hair market requirement. Hera mainly wholesale hair extensions, personal buyer can go to our online store to place order directly with Paypal.